SEOUL (Reuters) – The leaders of North and South Korea embraced on Friday after pledging to work for the “complete denuclearization of the Korean peninsula”, on a day of smiles and handshakes at the first inter-Korean summit in more than a decade. The two Koreas announced they would work with the United States and China this year to declare an official end to the 1950s Korean War and seek an agreement on “permanent” and “solid” peace. 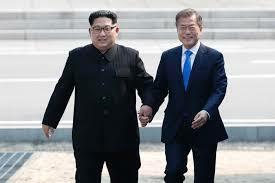 “The two leaders declare before our people of 80 million and the entire world there will be no more war on the Korean peninsula and a new age of peace has begun,” the two sides. Earlier, North Korea’s Kim Jong Un became the first North Korean leader since the 1950-53 Korean War to set foot in South Korea after shaking hands with his counterpart over a concrete curb marking the border in the heavily fortified demilitarized zone. Scenes of Moon and Kim joking and walking together marked a striking contrast to last year’s barrage of North Korean missile tests and its largest ever nuclear test that led to sweeping international sanctions and fears of war. Their meeting comes weeks before Kim is due to meet U.S. President Donald Trump in what would be the first ever meeting between sitting leaders of the two countries. China, North Korea’s main ally, welcomed the leaders’ statement and said it was willing to keep playing a proactive role in promoting political solutions. China is wary of being sidelined by a thaw between the two Koreas and by the upcoming summit between Trump and Kim. Global markets were lifted by hopes the summit would pave the way for the end of conflict on the Korean peninsula. Shares in Seoul briefly rose more than 1 percent to a one-month high and Japan’s Nikkei share average also gained. But there has been widespread scepticism about whether Kim is ready to abandon the nuclear arsenal his country has developed for decades, justifying it as a necessary deterrent against U.S. invasion. “Everything will not be resolved in the blink of an eye,” said Kim Young-hee, a North Korean defector-turned-economist at the Korea Development Bank. It is not the first time leaders of North and South Korea have declared hopes for peace. Two earlier summits, in Pyongyang in 2000 and 2007, failed to halt the North’s weapons program or improve relations in a lasting way. Later, with their wives, they watched a music performance and held hands as they watched a montage of photos from their summit set to a K-pop song that included the words “be a family again”. The United States stations 28,500 troops in South Korea as a legacy of the Korean War, which ended in a truce, not a peace treaty. The war pitted the South, U.N. and U.S. forces against the communist North, backed by China and Russia. I am one who sometimes enjoys a quick ‘Science Fiction” read. This one held my interest for a brief interval.